By Amy Malek, a board member and conference director of Iranian Alliances Across Borders (IAAB). In 2002, a group of Iranian-American students studying abroad made a wild and exaggerated observation: Iranians are everywhere. Of course, we didn’t mean on TV or in the movies. We meant that all of a sudden, Iranians seemed to be everywhere we went. We were young and traveling, discovering Iranian-Italian restaurants in Dublin, studying with Iranian-Norwegian classmates in London, and meeting Iranian-Colombian seatmates on high-speed trains across the continent. Our observation became a long-running joke: did we have Persian radar or something? How did we just happen to encounter one Iranian establishment after another by sheer luck? Or, could it be that there are really that many Iranians abroad, and we really are everywhere? The observation that the Iranian diaspora is widespread (if not precisely everywhere), was evident even then, but with a steadily growing media presence is perhaps even more so now. Unlike some diaspora groups who congregate primarily in one or two parts of the globe, the Iranian diaspora is comprised of communities on nearly every continent and subregion in the world. And in each of these communities, one finds Iranian immigrants (and their descendants) who have worked to bring Iranian culture to these new homes abroad, be it through opening restaurants and markets, creating Persian language schools and learning materials, or celebrating Iranian holidays and festivals. Each of these communities, from Europe to Asia and from Africa to the Americas, have specific histories and characteristics, particular relationships with their host communities, and nuanced sets of needs and challenges. And while many Iranian families are spread across several of these communities, for the most part it appears that the members, and particularly the leaders, of each community are largely focused on their own community, addressing their local needs in response to their own circumstances. ChaharShanbe Suri Celebrations in Stockholm, Sweden. This was another one of the observations raised by the co-founders of Iranian Alliances Across Borders (IAAB) while studying abroad in 2002-2003. Reflecting on the state of the Iranian diaspora at that time, it was not just international diaspora communities that seemed disconnected, and it was not just job-seeking adults who could benefit from an increasingly networked diaspora. At the time, there was but one still-nascent national Iranian-American organization, no organizations reaching out specifically to young Iranian Americans, and no organizations that we knew of with an international reach. With all the ways humans are capable of being connected in the 21st century, and with all that we can learn from each other, why didn’t we see increasing connections or collaborations across Iranian diaspora communities? IAAB co-founders Narges Bajoghli and Nikoo Paydar saw the need to connect Iranian communities around the world and to facilitate the building of our networks. Doing so could only bring positive change, whether through sharing creative solutions and best practices in various communities, providing a spark for collaborations between scholars, artists and activists, or learning how to speak with a collective voice in civil society. It was time to begin thinking critically about our communities and to start thinking about our impact not just as Iranians in LA, or Iranians in DC, but as Iranian Americans (hyphen optional). Perhaps most importantly, these two strong women recognized that it wasn’t just a matter of time before someone else would fulfill these needs - they recognized that if it was something that needed to happen, they should make it happen themselves. So, they proposed a two-day conference to which they would invite scholars, activists, artists, journalists, filmmakers and young leaders from around the world to discuss the state of the Iranian diaspora in as many arenas as possible, to have a dialogue about the meanings of being in diaspora and having hyphenated identities, and to identify the challenges that lay ahead for this diaspora’s future. Unlike my dear friends, I was more skeptical. I completely agreed with their ideas, loved their enthusiasm, and insisted that our larger community absolutely needed to come together - but I saw the roadblocks as insurmountable obstacles. How could a couple of undergraduates find and harness the funding, the support, and the networks to bring together a global community? When was the last time you heard of a two-day international conference of leading scholars and community leaders organized by a few 20-year-olds? It was worrisome to me that, at the time, we couldn’t look to our community for predecessors, only for support and gut-check guidance. We had to look to other communities, other immigrant groups, other young leaders in order to learn best practices, try to avoid common pitfalls, and make informed decisions. These factors convinced the skeptic in me that it was time to dream bigger, and these two young women with great vision, passion, and confidence in their mission convinced me it was not just a big dream; it was all possible. I joined IAAB in late 2003 - before our Camp Ayandeh became the highlight of hundreds of Iranian American high school students’ summers, before our I-CAN (IAAB Campus Action Network) connected over 40 Iranian American university groups, and before our Student Summit brought together Iranian American university leaders to learn and network with each other. I joined IAAB just before the firstConference on the Iranian Diaspora in 2004, that flagship IAAB event that has grown into the largest gathering of scholars, community leaders, journalists, artists, and students from around the world to discuss and disseminate cutting edge research, community organizing, and cultural productions in the Iranian diaspora. As a founding member, I can tell you that IAAB and its young staff have been dreaming big since day one (healthy skepticism permitting), and working to do just what its name suggests: create alliances and build networks across our many borders, be they state, national, ethnic, or otherwise, with the basic understanding that building our communities’ networks can only help to build better communities. 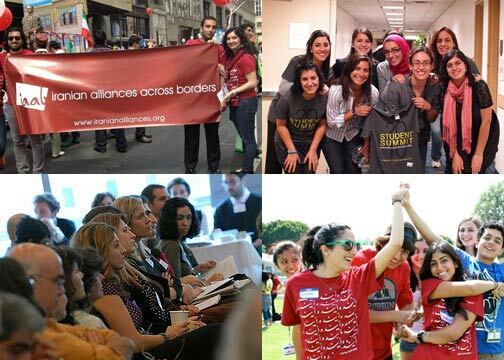 As times have changed, and IAAB and the Iranian diaspora have grown, there are now more national-level organizations in individual countries, increasing collaborations between individuals in disparate locations, cultural exchanges across borders, and efforts to improve international networks to aid when disasters strike, natural or otherwise. These advances are positive, but our global potential suggests the Iranian diaspora can do more to build our networks across communities. There are specific circumstances and obstacles facing each community, but there are also a number of common challenges that we should work to address through best practices and through learning from predecessors in other communities and in other parts of the diaspora. Where is the board of directors of a local Iranian community organization to turn for advice when they want to build a physical community center? How can educators in one Persian language school share good ideas and effective pedagogy with those in other communities? How can we learn from other groups’ experiences of fighting discrimination to avoid pitfalls and take advantage of previous successes? After four successful conferences in Boston, New York, Washington D.C., and Berkeley that brought together hundreds of scholars, community leaders, activists, and artists from around the world, this October 13-14, the fifth iteration of the IAAB International Conference on the Iranian Diaspora is coming to Los Angeles, the home of the largest community of Iranians outside of Iran. One of the goals of the 2012 IAAB Conference is to address just these issues, and to highlight organizations already working to address them on a local level. We aim to create a space where innovative individuals and organizations can meet to learn from one another, to create models for successful organizing, and to build networks for future collaborations. We believe that the Iranian diaspora can and should harness the tools at its disposal to work together towards common solutions and the empowerment of our youth, and it is our goal to facilitate the collaborations required to achieve this endeavor. In each IAAB Conference, our panels and workshops develop and expand on questions raised at the previous conference. At our first IAAB conference in 2004, we heard from scholars about who we were demographically, and from individuals’ experiences working through the challenges of feeling culturally and geographically in-between, and interrogating common notions of “home.” In 2005, we heard from authors, scholars, and legal experts about our lives in diaspora: how to make our voices heard in the general public, how to change our media representations, and how to know and defend our rights and civil liberties. And in 2007, Dr. Hamid Naficy challenged our understandings of identity yet again, arguing that while the hyphen looks and can feel like a minus in the face of discrimination, Iranians in diaspora are actually making it a “+”, creating new forms of culture and new ways of being, using our position as hyphenated to raise our voices against discrimination, racism, and injustices. These conversations have continued to develop, and each year we bring new challenges, new ideas, and new voices to the table. Which conversations at the IAAB Conference will spark new collaborations for our community? Whose presentation will inspire the next generation to think critically about our histories and cultures, about our rights and our identities? What will be the lessons shared there that will contribute to the betterment of our community? Through over 30 panel presentations, 5 roundtables, 5 workshops, 2 keynote addresses, and a film series, the possibilities are endless. Like each of its predecessors, the 2012 IAAB Conference will serve as a catalyst for positive change by creating innovative programming, offering opportunities to build networks and collaborations, encouraging critical engagement, and building support for growth within the Iranian diaspora community. Amy Malek is a board member and conference director of Iranian Alliances Across Borders (IAAB), a 501c3 non-profit organization working to strengthen the Iranian diaspora community through leadership and educational programming that encourages collaboration and solidarity across various borders and multiple communities. The 5th IAAB International Conference on the Iranian Diaspora will take place October 13-14, 2012 at the University of California, Los Angeles. Pre-register online at http://www.iranianalliances.org.